Julie Martin’s supportive teaching style is a deep look into mastering the foundation elements of improvisational theater. Julie’s 13 years of teaching experience helps you accelerate your improv skill and immerse yourself into the artistry and craft of improv. In a safe space, she encourages you to trust your creative center, while mastering skills to take you to the stage and strengthen your performance persona. Improv mastery happens within deep and present listening, taking the possibilities offered on stage. Julie teaches you to tap into your creativity and what is hidden within you. Instead of glimpsing at your potential she encourages your daring to discover your talents. Meet your inspired and creative nature, execute comedic scenes on the spot. She specializes in bringing out your confidence so you find your improvisational flow. If you would like to up your game, or if you are a beginner looking to start, Julie will support your developing talent. Games are used to simplify the learning process, to enable you to build flow on stage while training you to think outside the box! Mastering improv skills in a safe, supportive class environment allows you the freedom to develop confidence, savvy, spontaneity, and humor. Julie’s coaching and class sessions are held throughout the year in Manhattan/ Redondo/ Hermosa Beach. MIXED LEVELS CLASS, Beginners welcome! In this class, you will build core confidence, vision and experience your talent and skills, create a strong stage persona, and explore creating characters and points of view. Learn to play the scene you never expected. Develop “on your feet” fast trust and confidence. Sharpen core performing skills, boost communication, and up your game! 4. NEW CLASS SERIES Starting In June! Summer Classes begin Wednesday, June 5, 12, 19, 26 Location: 710 Pier Ave, 7 p.m.
Improvisation will upgrade your public speaking, acting, teaching, and leadership. Stop the “tongue-tied” or “I wish I would have said it” moments. Actors, educators, and business professionals are invited to participate in a safe setting, “where “make-it-up” comedy games encourage you to have more stage presence, be fast on your feet and more spontaneous. Find more agility as you communicate! Play, laugh and have fun as you learn core improv performing skills where there are no wrong answers. Improv performance fundamentals. Learn point of view, comedic co-creating, and straight -absurd play. Accelerate your skills, trust yourself and your reactions, make big choices and play confident. Prepare to take your skills to the stage. Instructor Permission Only Class, improvisational Actors Welcome. Boot camp Improv classes are outrageously fun AND you learn! Easily addicting, they provide a break from everyday life and teach skills current in our fast-paced communications world. They are informative, a hold on to your hat ride into the world of communication, comedy, acting, team building, spontaneity and ensemble stage work. Learn core performing skills, listening, and up your creative juice- guaranteed! Take a spin into the world away from your computer screen and jump into the arena of communication, scene building, and out of the box thinking that is comedy improvisational acting. Take your professional communications skills to the next level. Build confidence, speaking skills, leadership skills and effectively ask for the money you deserve. Ask for the sale or recruit people to your cause. Be more persuasive, have more presence and make more of an impact in your career of choice. Programs, classes available Monday, Thursday evening. Coaching class times available, or on-site scheduled for your group. 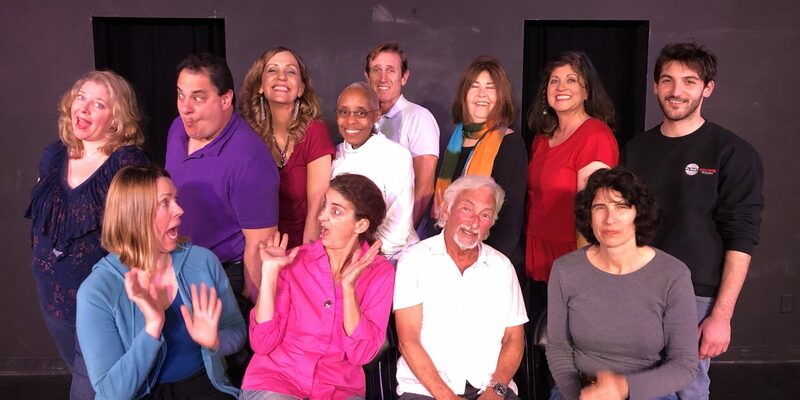 A variety of private coaching options are available for comedy improv performers. Coaching programs and consultations are available for professionals who are interested in speaking. leading, or performing in any way. Take your skills to the next level! Find out more, contact Julie at 310-697-3674.